Milling can be done with a wide range of machine tools. 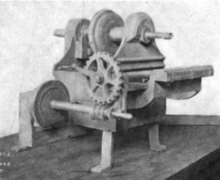 The original class of machine tools for milling was the milling machine (often called a mill). 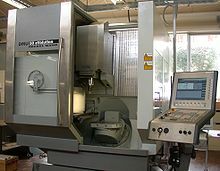 After the advent of computer numerical control (CNC) in the 1960s, milling machines evolved into machining centers: milling machines augmented by automatic tool changers, tool magazines or carousels, CNC capability, coolant systems, and enclosures. Milling centers are generally classified as vertical machining centers (VMCs) or horizontal machining centers (HMCs). The integration of milling into turning environments, and vice versa, began with live tooling for lathes and the occasional use of mills for turning operations. This led to a new class of machine tools, multitasking machines (MTMs), which are purpose-built to facilitate milling and turning within the same work envelope. There are cutting tools typically used in milling machines or machining centres to perform milling operations (and occasionally in other machine tools). 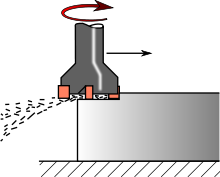 They remove material by their movement within the machine (e.g., a ball nose mill) or directly from the cutter's shape (e.g., a form tool such as a hobbing cutter). The face milling process can in principle produce very flat surfaces. However, in practice the result always shows visible trochoidal marks following the motion of points on the cutter's end face. These revolution marks give the characteristic finish of a face milled surface. Revolution marks can have significant roughness depending on factors such as flatness of the cutter's end face and the degree of perpendicularity between the cutter's rotation axis and feed direction. Often a final pass with a slow feed rate is used to improve the surface finish after the bulk of the material has been removed. In a precise face milling operation, the revolution marks will only be microscopic scratches due to imperfections in the cutting edge. 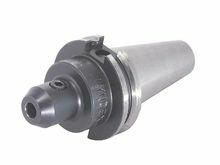 Milling is performed with a milling cutter in various forms, held in a collett or similar which, in turn, is held in the spindle of a milling machine. Mill orientation is the primary classification for milling machines. The two basic configurations are vertical and horizontal. However, there are alternative classifications according to method of control, size, purpose and power source. Planer-style mill (Plano Milling)Large mills built in the same configuration as planers except with a milling spindle instead of a planing head. This term is growing dated as planers themselves are largely a thing of the past. An improvement on CAT Tooling is BT Tooling, which looks similar and can easily be confused with CAT tooling. Like CAT Tooling, BT Tooling comes in a range of sizes and uses the same NMTB body taper. However, BT tooling is symmetrical about the spindle axis, which CAT tooling is not. This gives BT tooling greater stability and balance at high speeds. One other subtle difference between these two toolholders is the thread used to hold the pull stud. CAT Tooling is all Imperial thread and BT Tooling is all Metric thread. Note that this affects the pull stud only; it does not affect the tool that they can hold. Both types of tooling are sold to accept both Imperial and metric sized tools. Pocket milling has been regarded as one of the most widely used operations in machining. It is extensively used in aerospace and shipyard industries. In pocket milling the material inside an arbitrarily closed boundary on a flat surface of a work piece is removed to a fixed depth. Generally flat bottom end mills are used for pocket milling. Firstly roughing operation is done to remove the bulk of material and then the pocket is finished by a finish end mill. Most of the industrial milling operations can be taken care of by 2.5 axis CNC milling. This type of path control can machine up to 80% of all mechanical parts. Since the importance of pocket milling is very relevant, therefore effective pocketing approaches can result in reduction in machining time and cost.NC pocket milling can be carried out mainly by two tool paths, viz. linear and non-linear. In this approach, the tool travels along a gradually evolving spiral path. The spiral starts at the center of the pocket to be machined and the tool gradually moves towards the pocket boundary. The direction of the tool path changes progressively and local acceleration and deceleration of the tool are minimized. This reduces tool wear. 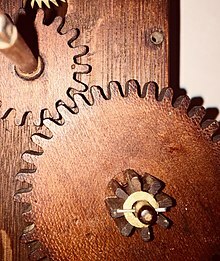 Milled gear teeth on a Terry style wooden movement clock. 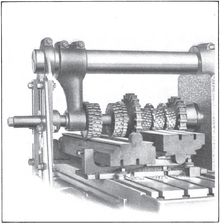 Milling machines evolved from the practice of rotary filing—that is, running a circular cutter with file-like teeth in the headstock of a lathe. Rotary filing and, later, true milling were developed to reduce time and effort spent hand-filing. The full story of milling machine development may never be known, because much early development took place in individual shops where few records were kept for posterity. However, the broad outlines are known, as summarized below. From a history-of-technology viewpoint, it is clear that the naming of this new type of machining with the term "milling" was an extension from that word's earlier senses of processing materials by abrading them in some way (cutting, grinding, crushing, etc.). Rotary filing long predated milling. A rotary file by Jacques de Vaucanson, circa 1760, is well known. 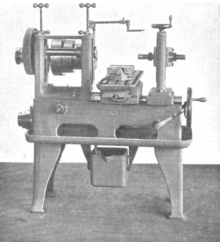 This milling machine was long credited to Eli Whitney and dated to circa 1818. From the 1910s through the 1940s, this version of its provenance was widely published. 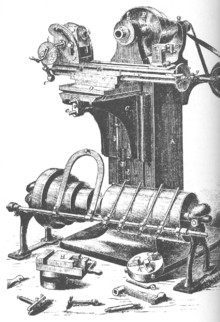 In the 1950s and 1960s, various historians of technology mostly discredited the view of this machine as the first miller and possibly even of Whitney as its builder. Nonetheless, it is still an important early milling machine, regardless of its exact provenance. 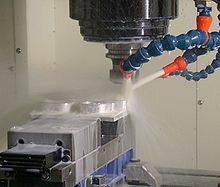 Computers and CNC machine tools continue to develop rapidly. The personal computer revolution has a great impact on this development. 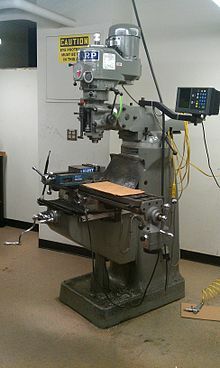 By the late 1980s small machine shops had desktop computers and CNC machine tools. 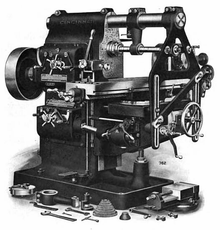 Soon after, hobbyists, artists, and designers began obtaining CNC mills and lathes. Manufacturers have started producing economically priced CNCs machines small enough to sit on a desktop which can cut at high resolution materials softer than stainless steel. They can be used to make anything from jewelry to printed circuit boards to gun parts, even fine art. National and international standards are used to standardize the definitions, environmental requirements, and test methods used for milling. Selection of the standard to be used is an agreement between the supplier and the user and has some significance in the design of the mill. In the United States, ASME has developed the standards B5.45-1972 Milling Machines and B94.19-1997 Milling Cutters and End Mills. General tolerances include: +/-.005" for local tolerances across most geometries, +/-.010" for plastics with variation depending on the size of the part, 0.030" minimum wall thickness for metals, and 0.060" minimum wall thickness for plastics. ^ CMMC 1992, pp. 125–127. ^ Kramer, Thomas R. (1992). "Pocket Milling with Tool Engagement Detection". Journal of Manufacturing Systems. 11 (2): 112–123. CiteSeerX 10.1.1.57.3646. doi:10.1016/0278-6125(92)90042-E. Retrieved 11 March 2015. ^ Held, Martin (1991). "A geometry-based investigation of the tool path generation for zigzag pocket machining". The Visual Computer. 7 (5–6): 296–308. doi:10.1007/BF01905694. ^ Choy, H.S. ; Chan, K.W. (February 2003). "A corner-looping based tool path for pocket milling". Computer-Aided Design. 35 (2): 155–166. doi:10.1016/S0010-4485(02)00049-0. ^ Hansen, Allan; Arbab, Farhad (April 1992). "An algorithm for generating NC tool paths for arbitrarily shaped pockets with islands". ACM Transactions on Graphics. 11 (2): 152–182. doi:10.1145/130826.130832. ^ Jeong, J.; Kim, K. (1998). "Tool Path Generation for Machining Free-Form Pockets Voronoi Diagrams". The International Journal of Advanced Manufacturing Technology. 14 (12): 876–881. doi:10.1007/BF01179076. ^ Persson, H. (May 1978). "NC machining of arbitrarily shaped pockets". Computer-Aided Design. 10 (3): 169–174. doi:10.1016/0010-4485(78)90141-0. Retrieved 12 March 2015. ^ Bieterman, Michael B.; Sandstrom, Donald R. (Nov 11, 2003). "A Curvilinear Tool-Path Method for Pocket Machining". Journal of Manufacturing Science and Engineering. 125 (4): 709–715. doi:10.1115/1.1596579. ^ "Design Guide: CNC Machining" (PDF). xometry.com. Roe, Joseph Wickham (1916), English and American Tool Builders, New Haven, Connecticut: Yale University Press, LCCN 16011753 . Reprinted by McGraw-Hill, New York and London, 1926 (LCCN 27-24075); and by Lindsay Publications, Inc., Bradley, Illinois, (ISBN 978-0-917914-73-7)..
Pease, William (1952), "An automatic machine tool", Scientific American, 187 (3): 101–115, doi:10.1038/scientificamerican0952-101, ISSN 0036-8733 . Baida, Peter (May–June 1987), "Eli Whitney's Other Talent", American Heritage, 38 (4), retrieved 2010-11-29. American Precision Museum (1992), "Rudolph Bannow (1897–1962)", Machine Tool Hall of Fame, American Precision Museum, retrieved 2011-01-01. 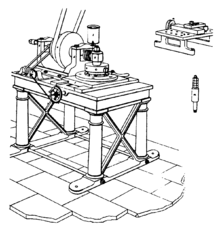 Wikimedia Commons has media related to Milling machines.